finish by the conclusions and perspectives. mesh topology as shown in Figure 1.
bi-directional ports: East, West, North, South, and Local. Figure 1. 4 × 4 mesh NoC structure. according to their bandwidth requirement. time it is visited by the scheduler. the queue, it is expressed in bytes. tum value each time the queue is visited by the scheduler. mining the number of bytes at the head of the queue. interface, toward a given server or router's performance. much more difficult the QoS implementation solutions. F and measure the time T taken to do so. move across a network connection defines the Latency. severe delays in the overall transmission . mutually agreed measures, usually by prioritizing traffic. chose k = 1.1 for example). 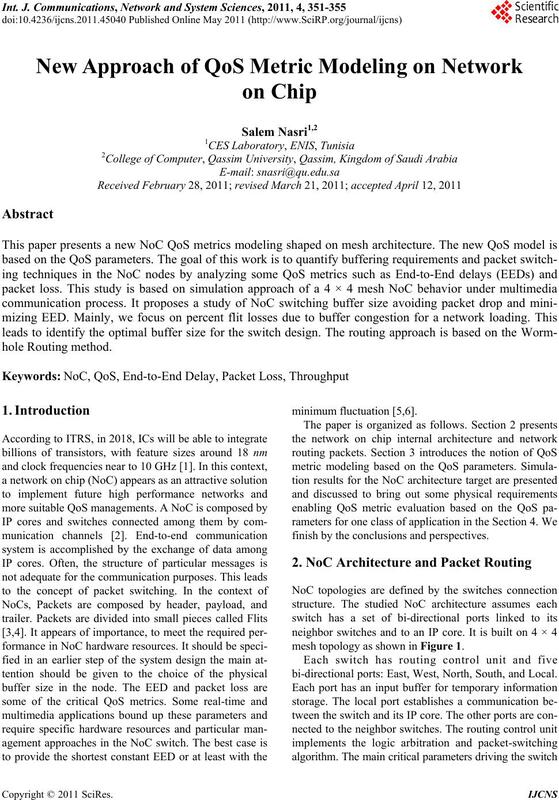 We use for this study the available network simulator NS. α1, α2 are arbitrarily fixed referring to the Equation (2). according to the interconnected IPs throughput . minimum buffer size avoiding dropped packets and EED. Figure 2. Dropped packe t s for 64 by te s buffer size. Figure 3. Dropped packets for 128 bytes buffer size. less with DWRR compared to FIFO scheduling. quirement, using priority queuing technique. decreases significantly with a buffer size value. with DWRR and FIFO scheduling (64 byte s buffer size). with DWRR and FIFO scheduling. (128 bytes buffer size). 0.5 and α1 = 0.2, α2 = 0.8.
pact on the QoS values. factors α1 = α2 = 0.5. Figure 7. %QoS for 128 bytes buffer size with α1 = α2= 0.5. Figure 8. 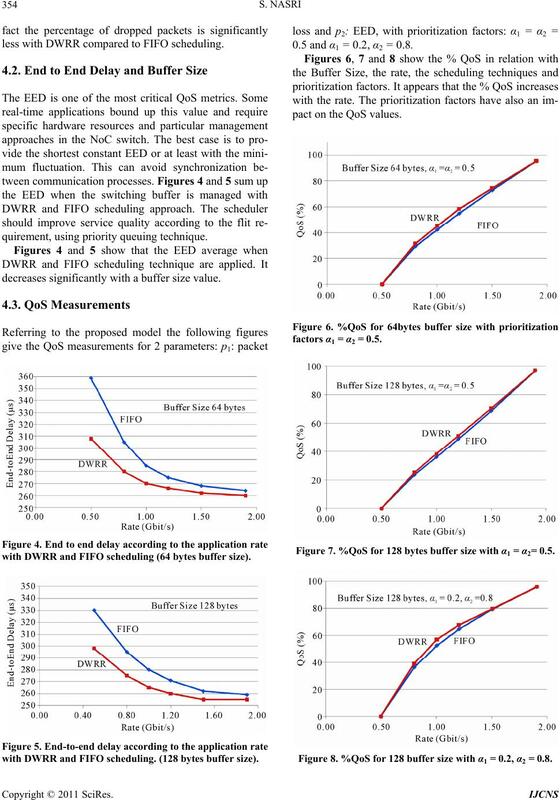 %QoS for 128 buffer size with α1 = 0.2, α2 = 0.8.
buffer such as priority queuing (Figures 6, 7 and 8). tiple applications with multiple QoS classes modeling. vey, Vol. 38, March 2006, pp. 1-51. J. Kim, D. Park, Ch. Nicopoulos, N. Vijaykrishnan and R.
communications systems, Princeton, NJ, USA, 2005, pp. 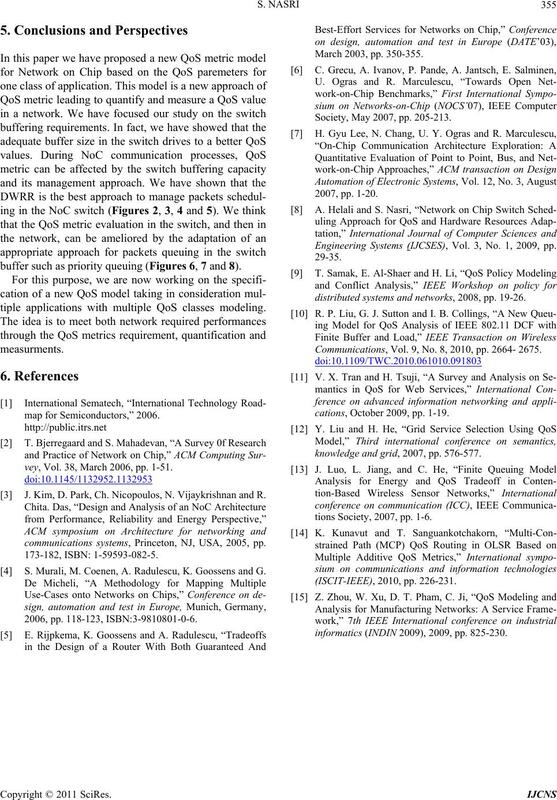 Coenen, A. Radulescu, K. Goossens and G.
Society, May 2007, pp. 205-213. Engineering Systems (IJCSES), Vol. 3, No. 1, 2009, pp. 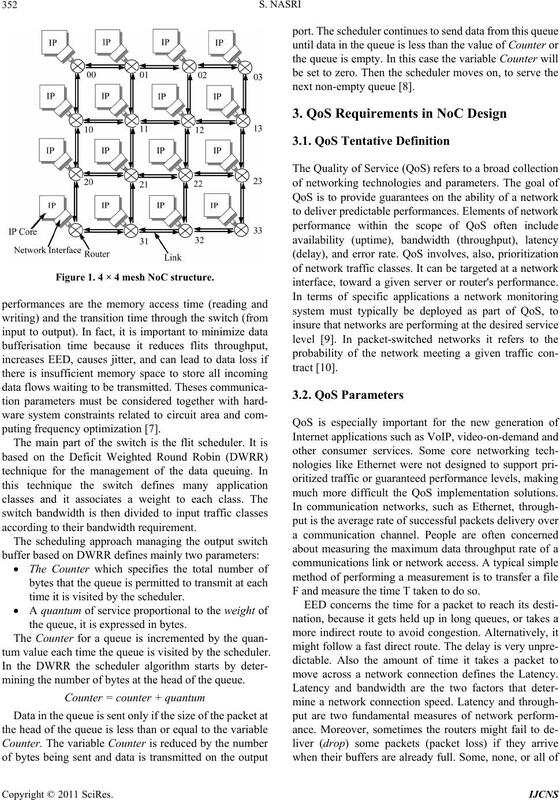 distributed systems and networks, 2008, pp. 19-26. Communications, Vol. 9, No. 8, 2010, pp. 2664- 2675.
cations, October 2009, pp. 1-19.
knowledge and grid, 2007, pp. 576-577.
tions Society, 2007, pp. 1-6.
informatics (INDIN 2009), 2009, pp. 825-230.